While my brothers and sisters were honor roll students, I was a mediocre student, predictably in the middle of my class. Sadly, my high school math average is – F.
However, I loved writing. Writing was the only occupation I knew where you got paid to lie. As a fourth grader, my first check as a writer was for $5 from a magazine that bought my story about the enormous snapping turtle in our pond. There was a snapping turtle. It was a whooper – just like the whooper about how much of a whooper the thing was! Our seventh grade history teacher assigned us homework over the weekend, a two-page story on the explorer Loof Lirpa, who had discovered America before Columbus. I promptly forgot the assignment until Monday morning when I heard complaints and groans from students who hadn’t written their two-page paper because they couldn’t find information on Lirpa. No problem. I sat down at my desk and zipped out two pages feeling snug that for once – just once – I would be ahead of my class instead of behind them. Our teacher asked how many people had completed their homework assignment. I proudly raised my hand. I felt like a champ when he invited me up to the front of the room to read my two-page report on the famous explorer. Later, when I was a brand new Christian and a single parent, our church scheduled a special offering for building repairs. I desperately wanted to give generously to the project, but I knew that I only had $25 in the bank until my next check – a week away. However, when I sat down and carefully added and subtracted everything, I found an extra $100. Elated, I wrote out a check to the church for the extra $100. A few days later, checks started bouncing. Sure, my math was bad. Sure, I failed math in school. But I had checked and rechecked…and the money should have been there. I marched into the bank with my check book to show them the deposits. They agreed with me and stopped all the bouncing checks and put money from the bank fees back into my account. They kept my check stub so their financial wizard could solve the conundrum. By the time they found the problem, I had received my paycheck and was in the clear…because the $100 really wasn’t in the account and never had been in the account. One of their cashiers had written a $10 deposit so sloppily that – even to the bank – it had looked like $100. The church got their offering, I got a week’s interest-free loan and no bank charges…God has a sense of humor! Perhaps the reason I’m so excited about my next Miz Mike Christian mystery-romance-suspense “Bridge Beyond Betrayal,” is that it’s funny. I love humor. 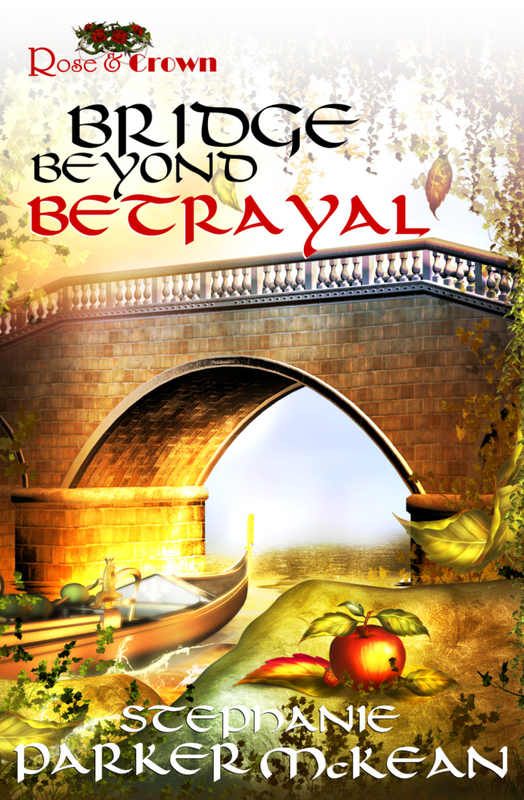 Bridge Beyond Betrayal is scheduled for release by Sunpenny Publishing Group on June 30. I can’t wait! I’m going to read it all over again just to get a good laugh! Hope a lot of folks will buy Bridge Beyond Betrayal and join me in laughter. Besides, I can’t keep adding to the Miz Mike series if the books don’t sell. Even with my limited math skills, I understand that. Writing, I love it! What other occupation pays liars? Posted on May 23, 2014 by authorstephanieparkermckean •	This entry was posted in Uncategorized and tagged Christian mystery-romance-suspense, explorer, god, humor, lies, Loof Lirpa, math, Sunpenny Publishing, writing. Bookmark the permalink. ← Mother’s Day – Don’t Leave the Kids Behind!